The Wedgelock 3000 is superior to cable railings in a wide variety of aspects. Cable rails are often presented as “invisible” and “sleek” but the fact is — our deck rail has floating corners, NO visible fasteners, fewer and smaller posts, fewer horizontals, and is just as easy to install as a cable rail, yet requires less maintenance over time. With traditional cable rails, you may not know what you’re getting into. With our Patented Wedge Lock 3000, you get a system designed for people who want a rail that will last. Our horizontals aren’t under tension, which gives the flexibility to use materials that won’t rust all over your deck. Another benefit of tension-less horizontals is there’s no risk of bowed ends (causing unsightly, uneven posts) and no cables to re-tighten or replace later on. Want more proof? Click here to see more advantages of our deck rail compared to a traditional cable rail. 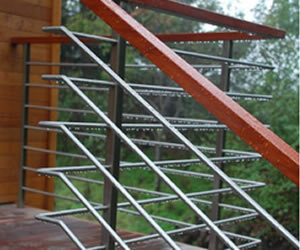 Our deck railing system is built to last and much more modern. Cables lose tension, sag, and break over time. Our rods will never droop or sag. Years after installation, they’ll look exactly as they did when they were new. Our floating corners actually enhance the view rather than obscuring it with cables (just look at the photo to the right). In addition, our systems have hidden fasteners, meaning unlike cable rail, there are no screws or turnbuckles to spoil the view. And, for clients who need something a bit different – perhaps a guard rail with glass, or a handrail – we can do that too. One thing we love to mention is that our system does NOT require any onsite welding — simple hand tools is all that’s needed for installation, perfect for the handy do-it-yourself’er or carpenter. 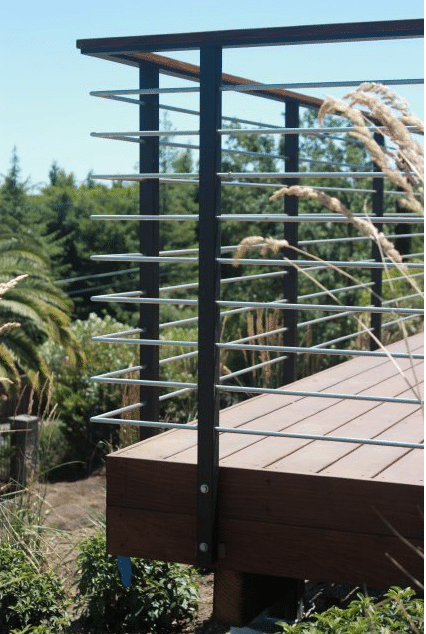 So say goodbye to traditional cable rail systems, and get in touch with us for a superior deck rail product. We are proud to offer deck railings that are sustainable. We love being green. The Wedge Lock 3000 system has environmental advantages over typical railing systems. Rather than un-sustainably harvested wood and metals that end up in landfill, our railings come in recycled and recyclable metal. Our railing posts and caps come standard in aluminum, which is highly recycled/recyclable, and the stainless rods and components we use all come from suppliers who are a part of the Specialty Steel Industry of North America Association (SSINA). Because most of our components are aluminum, which is much lighter than steel, there is a significantly lower environmental impact in shipping. And, after the very long and useful life span of our products, they are 100% recyclable. Read more about how we do our part in creating a sustainable deck railing system right here.